Background and objectives The main objectives of the Randomized Intervention for Children with Vesicoureteral Reflux (RIVUR) trial were to evaluate the role of antimicrobial prophylaxis in the prevention of recurrent urinary tract infection (UTI) and renal scarring in children with vesicoureteral reflux (VUR). We present a comprehensive evaluation of renal scarring outcomes in RIVUR trial participants. Design, setting, participants, & measurements This multicenter, randomized, placebo-controlled trial enrolled 607 children aged 2–71 months with grade 1–4 VUR diagnosed after a first or second febrile or symptomatic UTI. Study participants received trimethoprim-sulfamethoxazole or placebo and were followed for 2 years. Renal scarring was evaluated by baseline and follow-up 99mtechnetium dimercaptosuccinic acid (DMSA) renal scans that were reviewed independently by two blinded reference radiologists. Results At the end of the study, 58 (10%) of 599 children and 63 (5%) of 1197 renal units had renal scarring. New renal scarring did not differ between the prophylaxis and placebo groups (6% versus 7%, respectively). Children with renal scarring were significantly older (median age, 26 versus 11 months; P=0.01), had a second UTI before enrollment (odds ratio [OR], 2.85; 95% confidence interval [95% CI], 1.38 to 5.92), were more likely to be Hispanic (OR, 2.22; 95% CI, 1.13 to 4.34), and had higher grades of VUR (OR, 2.79; 95% CI, 1.56 to 5.0). The proportion of new scars in renal units with grade 4 VUR was significantly higher than in units with no VUR (OR, 24.2; 95% CI, 6.4 to 91.2). Conclusions Significantly more renal scarring was seen in relatively older children and in those with a second episode of febrile or symptomatic UTI before randomization. Preexisting and new renal scars occurred significantly more in renal units with grade 4 VUR than in those with low-grade or no VUR. Antimicrobial prophylaxis did not decrease the risk of renal scarring. Vesicoureteral reflux (VUR) is one of the most common congenital urinary tract abnormalities diagnosed in childhood. The reported prevalence is about 1%, although some believe that it may actually be higher (1,2). VUR is believed to predispose to urinary tract infection (UTI) and renal scarring. In a systematic review, Shaikh et al. (3) reported a relative risk (RR) of 1.5 (95% confidence interval [95% CI], 1.1 to 1.9) for acute pyelonephritis (APN) in children with VUR compared with those without VUR and an RR of 2.6 (95% CI, 1.7 to 3.9) for renal scarring. Children with VUR grades 3 or higher have a higher risk of renal scarring compared with those with lower grades (RR, 2.1; 95% CI, 1.4 to 3.2) (3). In another systematic review, Faust et al. (4) reported odds ratios (ORs) of 2.8 (95% CI, 1.9 to 4.2) and 3.7 (95% CI, 1.3 to 11.1) for renal scarring after APN in children with VUR and renal units with refluxing ureters, respectively. The authors concluded that children with VUR have an increased risk of renal scarring (4). Renal scarring associated with VUR is also known as reflux nephropathy (RN). Long-term potential complications of RN include hypertension, proteinuria, and progression to ESRD (5). Many prospective studies have evaluated the role of antimicrobial prophylaxis in the prevention of UTI recurrence and renal scarring in children with primary VUR (6). This includes our recently published Randomized Intervention for Children with Vesicoureteral Reflux (RIVUR) trial (7). The primary outcome of the RIVUR trial was recurrence of a febrile or symptomatic UTI. We found a significantly lower risk of UTI recurrence in children receiving antimicrobial prophylaxis than in those receiving placebo (RR, 0.55; 95% CI, 0.38 to 0.78) (7). Renal scarring was a prespecified secondary outcome of the RIVUR trial. The present report represents a comprehensive evaluation of renal scarring outcomes in RIVUR trial participants. Details on methods for patient selection, data collection, and power analysis for the RIVUR trial have been described previously (8,9). The RIVUR trial was a multicenter, randomized, placebo-controlled trial in 607 children aged 2–71 months with grade 1–4 primary VUR diagnosed after a first or second febrile or symptomatic UTI. Study participants received trimethoprim-sulfamethoxazole (TMP-SMZ) or a closely matched placebo and were followed up on for 2 years. The Data Coordinating Center ensured that all participants, clinical site investigators, and radiologists were blinded to randomization assignment; participants and clinical site investigators were further blinded to trial outcome data during the trial. Pilot studies were conducted to ensure uniformity in methods and imaging quality for 99mtechnetium dimercaptosuccinic acid scintigraphy (DMSA renal scans) (10) and voiding cystourethrogram (VCUG) (11). All DMSA renal scans for the RIVUR trial were reviewed independently by two blinded reference radiologists (M.M. and H.Z. ), and all differences were adjudicated to obtain a consensus reading between the two. In view of our pilot study results and to facilitate standardization and quality control across multiple participating sites, we required planar images using parallel-hole collimator (low-energy high-resolution; 256×256 matrix; 500,000–1,000,000 counts per image) or pinhole collimator (3- to 4-mm pinhole insert; 150,000 counts or 10 minutes). DMSA renal scans were obtained 1.5–3 hours after intravenous administration of an age-appropriate dose of DMSA, 3–5 mCi/1.73 m2 body surface area or 50–100 µCi/kg body wt (minimum dose of 0.5–1 mCi). Posterior and posterior-oblique renal images were acquired. Differential renal function was calculated on the posterior image by subtracting background counts and calculating for each kidney the percentage of total counts for both kidneys. Single-photon emission computed tomography (SPECT) was not accepted for this study (10). Per the RIVUR trial protocol, study participants were scheduled for three DMSA renal scans. The baseline scan was obtained within 2 weeks of randomization and ≤112 days from the index UTI. A second DMSA scan was obtained within 21 days of the 12-month follow-up visit. The outcome scan was targeted within 10 days of the study exit visit at 24 months after randomization. For all children with treatment failure, the outcome DMSA scan was obtained approximately 4 months after meeting criteria for treatment failure. Definition of kidney segments and details on renal units included in the study are shown in Supplemental Figure 1 and Table 1, respectively. Of 607 RIVUR trial participants, we excluded six children with missing DMSA scans, one child with missing central VCUG reading, and one child who had a horseshoe kidney, resulting in a total of 599 children for the present analyses. Exceptions to the RIVUR criteria for determining renal scarring on the outcome scan (scan collected 2 years after enrollment or 4 months after patient was categorized as having treatment failure) were use of a baseline or follow-up scan with scarring for six children with no per protocol outcome scan and use of a follow-up scan with scarring for six children who had no scarring on their per protocol outcome scan. 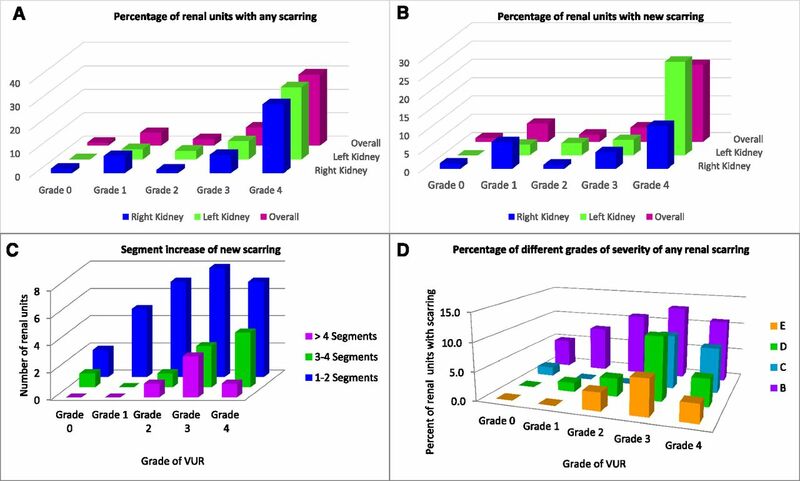 Descriptive statistics and frequency distributions were used to describe all variables; we compared overall and new renal units’ scarring by grade of VUR. With the exception of age, for which a Kruskal–Wallis test was performed because of the skewed distribution, we used a chi-squared test for characteristics according to presence of scarring for categorical variables; if an expected cell count was under five, we used the Fisher exact test. To account for within-participant correlations and test the association of treatment group by renal scarring, we used the generalized estimating equation method. All analyses were performed in SAS software, version 9.2. The numbers of children and renal units included in these analyses are shown in Figure 1. Bilateral VUR was present in 288 children and unilateral VUR in 311. 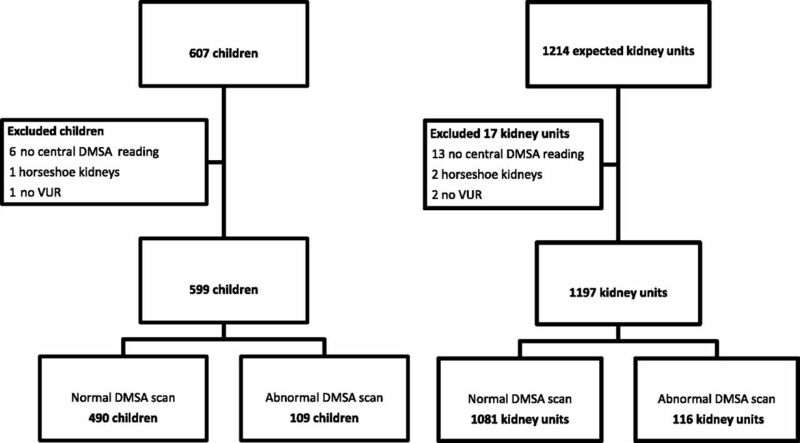 Of 599 children, 109 (116 renal units) had abnormal DMSA scan findings. Of these, 58 (10%) children had renal scarring, including five children with bilateral renal scarring. The other 51 children had APN that did not progress to renal scarring on follow-up scan(s), or the child had only one scan that showed APN. Altogether, 63 (5%) of 1197 renal units had scarring, which included 43 units with new scarring (Supplemental Figure 2). Number of children and renal units included in the analyses. Of the 599 children analyzed, 109 (18%) had abnormal 99mtechnetium dimercaptosuccinic acid (DMSA) scan findings. Of the 1197 renal units, 116 (10%) had abnormal DMSA scan findings. VUR, vesicoureteral reflux. Baseline demographic and clinical characteristics for children with renal scarring are shown in Table 2. Children with any renal scarring were significantly older than those with no scarring (median age, 26 versus 11 months; P=0.01). Significantly more renal scars were noted in children who had a second febrile or symptomatic UTI before enrollment (OR, 2.85; 95% CI, 1.38 to 5.92); in Hispanic children (OR, 2.22; 95% CI, 1.13 to 4.34); in toilet-trained children (OR, 2.78; 95% CI, 1.59 to 4.89); and in children with hydronephrosis (OR, 4.61; 95% CI, 2.00 to 10.62), ureteral duplication (OR, 3.34; 95% CI, 1.43 to 7.81), and higher grades of VUR (OR, 2.79; 95% CI, 1.56 to 5.0). We found similar results for new scarring versus no scarring present. As shown in Table 3, antimicrobial prophylaxis did not prevent new renal scarring in children receiving prophylaxis compared with those receiving placebo (6% versus 7%, respectively). Similarly, no treatment group difference in renal scarring was noted in renal units (4% for both) (Table 3). The proportions of renal units with any scarring and new scarring by grade of VUR are shown in Figure 2, A and B, respectively. The overall proportions of renal units with any scarring were four of 311 (1%), six of 109 (6%), 11 of 400 (3%), 25 of 321 (8%), and 17 of 56 (30%) for grades 0, 1, 2, 3, and 4 VUR, respectively (P< 0.001 for grade 4 versus all other grades). For new scarring, corresponding proportions were three of 311 (1%), five of 109 (5%), nine of 400 (2%), 14 of 321 (4%), and 12 of 56 (21%) for grades 0, 1, 2, 3, and 4 VUR, respectively (P<0.001 for grade 4 versus all other grades). Renal units with renal scarring by vesicoureteral reflux (VUR) grade. (A) (Any scarring): The percentage of renal units with any scarring was highest in grade 4 VUR; four of 311 (1%), six of 109 (6%), 11 of 400 (3%), 25 of 321 (8%), and 17 of 56 (30%) for grades 0, 1, 2, 3, and 4 VUR, respectively (P<0.001 for grade 4 versus all other grades). (B) (New scarring): The percentage of renal units with new scarring was highest in grade 4 VUR; three of 311 (1%), five of 109 (5%), nine of 400 (2%), 14 of 321 (4%), and 12 of 56 (21%) for grades 0, 1, 2, 3, and 4 VUR, respectively (P<0.001 for grade 4 versus all other grades). (C) (Segment increase in new scarring): Grade 1 (one or two segments) scarring was the most common segment increase in new scarring in 29 of 43 (67%) renal units, occurring in two, five, seven, eight, and seven renal units with grades 0, 1, 2, 3, and 4 VUR, respectively. A one-segment increase in new renal scarring was present in 33% of children, 35% had a two-segment increase, 21% had a three to four-segment increase, and 12% had a five-segment or greater increase. (D) (Severity grade of any scarring): Among 63 renal units with any scarring, grade B (mild) renal scarring was seen in more patients than grades C, D, and E (5%, 8%, 11%, 13%, and 11%, respectively, for grades 0, 1, 2, 3, and 4 VUR). The presence of VUR and segment (grade) increase in new renal scarring during follow-up in 43 affected renal units is shown in Figure 2C. Grade 1 (one or two segments) scarring was the most common segment increase in 29 (67%) renal units, occurring in two, five, seven, eight, and seven renal units with grade 0, 1, 2, 3, and 4 VUR, respectively. Approximately one third (33%) of children had a one-segment increase in new renal scarring, another third (35%) had a two-segment increase, 21% had a three- to four-segment increase, and 12% had a five-segment or greater increase. The proportion of different grades of severity of any renal scarring in 63 renal units is shown in Figure 2D. Grade B (mild) renal scarring was seen in more patients than were grades C, D, and E (5%, 8%, 11%, 13%, and 11%, respectively, for grade 0, 1, 2, 3, and 4 VUR). Mean DMSA uptake in renal units with any renal scarring for the right kidney was 43%±9.8% and for the left kidney 42%±8.6%. A slightly decreasing trend on both the right and left kidneys with regard to mean percentage DMSA uptake in normal renal units without VUR and those with varying degrees of VUR was noted (P<0.01 and P<0.001, respectively). The mean percentage uptakes for the left kidneys were 52%, 50%, 51%, 50%, and 49% and for the right kidney 51%, 50%, 50%, 50%, and 48% for grade 0, 1, 2, 3, and 4 VUR, respectively (Figure 3). 99mtechnetium dimercaptosuccinic acid (DMSA) uptake in normal renal units with no scarring. A slightly decreasing trend existed in the right and left kidneys with regard to mean percentage DMSA uptake in normal renal units without vesicoureteral reflux (VUR) and those with varying degrees of VUR (P=0.01 and P<0.001, respectively). The mean percentage uptakes for the left kidneys were 52%, 50%, 51%, 50%, and 49% and for the right kidney 51%, 50%, 50%, 50%, and 48% for grade 0, 1, 2, 3, and 4 VUR, respectively. RN due to APN, also called acquired RN, can result from a single episode of APN or may take several years to develop (12,13). In VUR, scarring tends to occur at the renal poles because of the presence of extensively fused (compound) renal papillae, which allows the entry of infected urine into the renal parenchyma (14). RN may also be a result of abnormal renal development resulting in focal renal hypoplasia or dysplasia (15), which is called congenital RN. The DMSA renal scan is the current gold standard for diagnosing renal scarring but does not help distinguish acquired from congenital RN. This distinction made on the basis of a preceding UTI may be arbitrary because the possibility of a preexisting renal scar before a UTI cannot always be ruled out. In the present study, 58 (10%) of 599 children had renal scarring at the end of the study, which includes 40 (69%) children with new scarring. Twenty (3%) children had renal scars in baseline scans, possibly congenital in origin unless they had UTIs before the documented index UTI, a possibility that could not be ruled out with certainty. In patients (n=41) with treatment failure, the median time from randomization to the protocol outcome renal scan (4 months after treatment failure) was 13 months, and it is possible that scans in these patients at 2 years would have revealed more new scars or worsening of existing scars. Our study revealed that renal scarring is more likely in older children than younger children and in those with a second episode of UTI. These observations raise important questions. Are infants truly at a higher risk of renal scarring with APN compared with older children, as initially reported in the International Reflux Study (16) and subsequently endorsed by others (17,18). Recent studies have already questioned this conventional wisdom by reporting that younger age may not be a risk factor for renal scarring (19,20); the risk in older children may even be higher (21,22). In addition, the recommendation by the American Academy of Pediatrics and National Institute for Health and Clinical Excellence guidelines (23,24) to delay VCUG until the second episode of UTI may need to be reviewed. The incidence of new renal scarring in children receiving antimicrobial prophylaxis did not differ from that in patients receiving placebo, whether in terms of the proportion of children (6% and 7%) or renal units (4% versus 4%). These results are similar to those reported in other recent studies that evaluated the role of antimicrobial prophylaxis in reducing the risk of renal scarring (25–29). However, these results should not be interpreted as conclusive evidence against the role of antimicrobial prophylaxis in preventing renal scarring. None of these studies, including the RIVUR trial, were designed primarily to evaluate the role of antimicrobial prophylaxis in preventing scarring. Further, a follow-up of 1–2 years may have been too short to determine long-term risk for the development of renal scarring or the effect of antimicrobial prophylaxis in its prevention. The risk may also have been lowered by extra vigilance during the study period. Our study revealed a higher risk of preexisting as well as new renal scarring in renal units with grade 4 VUR compared with no VUR or grade 1–3 VUR. After adjustment for correlated outcome data, scarring was 27 times more likely to be observed in renal units with grade 4 VUR compared with units with no VUR (95% CI, 8.3 to 89.6) and six times more likely compared with units with grades 1–3 VUR (95% CI, 3.4 to 19.7). Few new scars occurred in renal units with no VUR. Units with grade 4 VUR were 24 times more likely to have new scarring compared with units with no VUR (95% CI, 6.4 to 91.2) and six times more likely to have new scarring compared with units with grade 1–3 VUR (95% CI, 3.2 to 11.7).These observations support the argument in favor of high-grade VUR being a risk factor for preexisting as well as new renal scarring. However, most children diagnosed with VUR after a UTI have low-grade VUR (grades 1–3), but they remain at some, although lower, risk for renal scarring. Children in our study were followed for 2 years. At the end of follow-up, approximately two thirds of renal units with renal scarring had a one-segment (33%) or two-segment (35%) increase in scarring; the remaining third had a three- to four-segment (21%) or ≥five-segment (12%) increase in scarring. The possibility of developing scarring in additional segments in these renal units in the future cannot be ruled out. The proportion of children with any renal scars in the RIVUR trial (10%) was higher than the 6% reported by Garin et al. (25) and lower than the 30%–63% reported in other recent studies (26–29). We believe that the low incidence of renal scarring in our study may be related to the exclusion of children with more than two febrile or symptomatic UTIs, careful monitoring for UTI recurrence, prompt intervention during the study period, generally younger study cohort, and the exclusion of children with grade 5 VUR in comparison to the study by Craig et al. (28). However, the number of children with renal scarring reported in the studies mentioned earlier show a strong negative correlation (r=−0.7) with the percentage of female patients included in each study (Figure 4). This could be due to a higher incidence of congenital scarring in male patients and their circumcision status; the latter, which is practiced widely in the United States, decreases the likelihood of UTI recurrence. 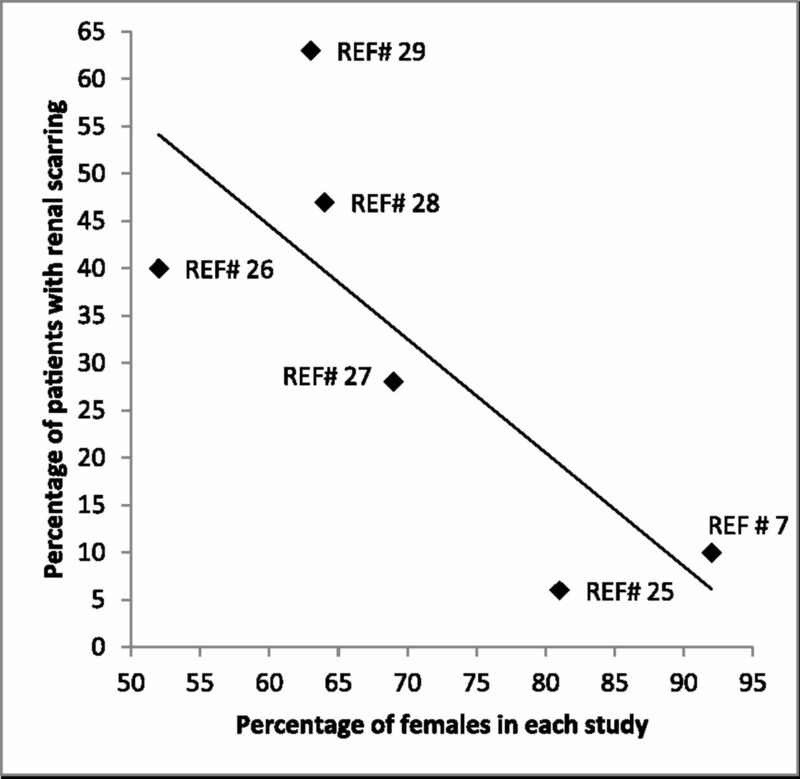 Percentage of female patients in recent prospective studies. The percentage of study participants with renal scarring in the Randomized Intervention for Children with Vesicoureteral Reflux (RIVUR) study was 10%. Comparison of our data with other similar recent studies shows that the number of patients with scarring in each study correlated (r=−0.7) with the number of females included in the study. REF# indicates number in the reference list for the study. Our incidental finding of a significant decreasing trend in mean percentage DMSA uptake in normal renal units with different grades of VUR in comparison to renal units with no VUR is interesting. If true, it raises the possibility of subtle intrinsic renal parenchymal abnormality associated with high-grade VUR affecting DMSA uptake in such kidneys with no apparent cortical defect. This observation needs to be confirmed in a larger cohort and, more important, in renal units with grade 5 VUR. We used the DMSA renal scan because of its superiority over renal ultrasonography for the diagnosis of APN and renal scarring, which has been demonstrated in multiple studies, including experimental studies (30–33). Of the various methods available for doing DMSA renal scans, we used planar images instead of SPECT because the latter would have posed substantial problems in standardization, quality control, and the review process (10). Furthermore, some studies have reported that the SPECT images offer no statistically significant diagnostic advantage over planar imaging for detection of cortical defects (30,34). The RIVUR trial was not powered to evaluate renal scarring as a primary outcome. Therefore, the relatively small number of children with renal scarring limits the scope of this study, particularly for subgroup analysis. The strength, however, is its unprecedented quality in terms of pilot studies, independent interpretation by two radiologists blinded to clinical data, and study investigators blinded to patient assignment of study medication and outcome classification. In view of these, we believe that the data presented are a true representation of renal scarring as diagnosed by DMSA renal scans in young children in the United States with grade 1–4 VUR diagnosed after UTI. The authors thank the RIVUR participants, their families, and participating physicians, investigators, and staff for making this research possible. We also thank Lena Peschansky and Catherine Klida at Wayne State University for their help. This research was supported by grants U01 DK074059 (M.A.C. ), U01 DK074053 (A.H.), U01 DK074082 (R.M. ), U01 DK074064 (R.K.), U01 DK074062 (T.K.M. ), and U01 DK074063 (S.P.G.) from the National Institute of Diabetes and Digestive and Kidney Diseases, National Institutes of Health, Department of Health and Human Services. This article contains supplemental material online at http://cjasn.asnjournals.org/lookup/suppl/doi:10.2215/CJN.05210515/-/DCSupplemental.